Shipwrecks—from TITANIC to USS MONITOR and many others—hold many scientific secrets about how the ocean works. We will explore the science of shipwrecks in the tropics and near the poles. We will see wrecks in warm shallow waters and in the cold deep oceans. Using underwater images, we will see some stunning scientific discoveries on shipwrecks that have changed how we understand the oceans. People interested in learning more about shipwrecks are invited to attend the free Junior Cafe presentation on Saturday, January 18, from 9:30 a.m. to 11 a.m. at the Milton J. Rubenstein Museum of Science and Technology (MOST) in Syracuse’s Armory Square. Walk-ins are welcome, but we ask that people RSVP by emailing jrcafe@tacny.org by January 15, 2014. Cathryn R. Newton Ph.D., is Dean Emerita and Professor of Earth Sciences and Interdisciplinary Sciences in the College of Arts and Sciences at Syracuse University. 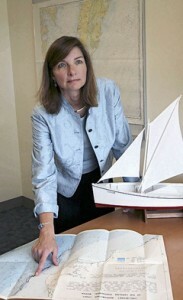 She is an ocean scientist, paleobiologist, and environmental stratigrapher, has published scores of scientific papers concerning modern and ancient marine communities, especially deep-water coral reefs; ecological dynamics of mass extinctions; and quantitative paleoecological theories of how communities work. Several of her papers have been selected as “Science Classics” in the journal Science. Newton’s work is based upon extensive field work and intensive research in museum collections around the world. She has won numerous awards for both research and teaching, including Syracuse University Scholar-Teacher of the Year. She chaired the Department of Earth Sciences as Jessie Page Heroy Professor of Geology (1993-2000) and led the College of Arts and Sciences as its first woman dean in 2000-2008. She has been instrumental in the Renée Crown University Honors Program, and was founding co-director of the Women in Science and Engineering program at Syracuse, a program she has actively supported since 1997. The daughter of an oceanographer and an English teacher and writer, Newton grew up in small coastal communities at an unusual time in American history. Newton, as a 16-year-old Duke sophomore, was the youngest scientist on the Duke-MIT-North Carolina-Delaware oceanographic team that discovered the wreck of USS Monitor off North Carolina in 1973 (her book on this experience is forthcoming! ).